As a new blogger, I was surprised and honored to be selected for an award. Greg Mercer from Big Red Carpet Nursing nominated me for the One Lovely Blog Award. Thank you Greg, for this One Lovely Blog Award! Nominations are chosen by fellow bloggers for those newer or up-and-coming bloggers. The goal is to help give recognition and to also help the new blogger reach more viewers. It also recognizes blogs that are considered to be “lovely” by the fellow-blogger who choses them. This award acknowledges bloggers who share their story or thoughts in a beautiful manner to connect with their viewers and followers. In order to “accept” the award the nominated blogger must follow several guidelines. 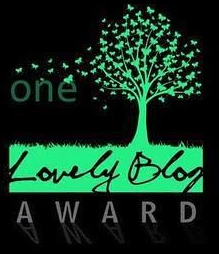 List the Rules and Display the One Lovely Blog Award logo to you post and/or blog. Nominate around 15 bloggers that you admire and inform the nominees by commenting on their blog. Follow the blogger that nominated you (if not already)! Not because of the rule to nominate 15 bloggers and not because the award is for newer or up-and-coming bloggers, I want to nominate the following bloggers because they are experienced bloggers. I know them through their interesting and creative blog sites. I’ve learned a thing or two by following them! I appreciate and I’m grateful for all of the people who chose to read and follow my blog. I thank you, new blogger friends on the nomination list, and those not on the list. There really could be more. But there’s acceptance work involved and some bloggers are too busy writing books or creating new and interested posts. And some bloggers have too many awards (can that really happen?) and not accepting more, while other have hundreds of followers already (could there be too many?). Some of you busy, busy bloggers and bloggers with many, many followers on the list qualify for not accepting the nomination. I do understand. Please keep the thank you and gratitude anyway for following my blog. I’ll let you know about your nomination in a comment on your site. It will take me a little time. Don’t be shocked if you get this post beforehand. http://silverthreading.com – This is her 3rd One Lovely award! http://lifeinbetween.me – Jodi has been nominated before for this award. http://vanbytheriver.wordpress.com – She loves poetry and music. http://grandmalin.wordpress.com – Too many awards but not The One Lovely Blog! http://barbarapyett.wordpress.com – Children’s Book Author among other things! Now for the 7 things about me! I was an Ex-Pat for 15 years in Italy, Greece and Japan (5 years in each country). I wrote a poem and gave it to TV/film actor Telly Savalis for his mother, Christina. I went to Washington State U. WITH my two sons, and their girlfriends (now wives). I modeled for an Illustrator Photographer and was featured on east coast billboards! I skied on the Matterhorn (Italian Alps) every winter while in Italy. I published poetry, and it led me to creative non-fiction writing. I love dogs and have 2 handsome Shi Tzus, Sammy and Charley! This entry was posted in Awards, My Blog, My Entries and tagged 7 things about me, Acceptance, Greg Mercer, Happy surprise, Nominating others, Nomination, One Lovely Blog Award, Thank you new blogger friends, Thoughtful. Bookmark the permalink. Meg, thank you so much for your congratulations on the award. When I put the around 15 nomination list together, I forgot to include you! I’m sorry! It was a lot of work and the pressure was on to complete the rules! You do have One Lovely Blog and I’d like to nominate you for the award. We’ve been blogger friends for some time now and I love your writing, especially continuing parts of Beatitude Point! I don’t know if your site is “award-free” (many are) or if you are too busy writing to accept. I’ll understand. Which ever way it goes, please keep the thank you and gratitude anyway for following my blog. Thank you Meg for your comment. Yes, I’ll be heading over to read more of your posts. You have a very kind heart and a wonderful writing style. Thanks so much for accepting the award, Merideth! I know it’s a lot of work and I appreciate you taking it on. You do have One Lovely Blog! Hopefully you can find the rules and take the logo from this post. I’m a new blogger, not tech savvy, and don’t know how to link this to you. Thank you so much for thinking so highly of me to mention and nominate me, Christine. I am very appreciative and flattered! You are very welcome, Jodi! Now if I could bake, craft and take beautiful pictures like you, I’d be way ahead in my blogging posts! You are too kind! I Love to read what you write! Congratulations! So nice to receive warm praise from fellow bloggers! Barbara, thank you for your congratulations and comment. I love your blog, Your Happy Place, The Westies, The Barn, The Silver, Your Humor and probably everything else that I’ll see and read about in good time. Thank you for following my blog too! Thank YOU so much! I just love meeting new people through blogging….all the overlapping layers leading us to each other through our blogs. Looking forward to reading more about you too, C. E.! Have a great weekend. Christine, congratulations!! You DO have a lovely blog, and even more are a lovely person! In the short time I have been reading your posts, i appreciste how upbeat you are and how you spread that joy. Thank you so much for nominating me. That thrill – knowing that another blogger is thinking of me – never gets old. We write to scratch our own itch, but the truth is we want to touch others with our words. I truly appreciate your support and encouragement. Thanks Sammy D for your congratulations and comments. Glad that you liked the nomination. Yes it does say I’m thinking about you and your blog is on my preferred list. I’m trying my hand at humor in writing to back up the blog sub-title – remember what made you smile. Hoping for big smiles and laughs! Congrats on the award and nice to find your blog here! Thanks so much Christy for your congrats comment. Glad you visited my site. I’m heading over to poetparfait now to check it out! Jean, thanks for the link. Your site is awesome…helpful and informative. And you are deserving of all your awards! Colleen, thanks for letting me know of your award-free status. Such a hard decision to make! Now your time opens up to do more writing and commenting on followers’ blogs.